On August 6 of last year, Honesto Silva Ibarra died in a Seattle hospital. Silva was a guest worker-a Mexican farm worker brought to the United States under contract to pick blueberries. He worked first in Delano, California, and then in Sumas, Washington, next to the Canadian border. His death, and the political and legal firestorm it ignited, has unveiled a contract labor scheme reminiscent of the United States’ infamously exploitative mid-century Bracero Program. Those demands, as described in the complaint, were extreme, and Silva’s coworkers believe he died as a result. Sarbanand Farms belongs to Munger Brothers, a family corporation in Delano, California. Since 2006, the company has annually brought more than 600 workers from Mexico under the H-2A visa program to harvest 3,000 acres of blueberries in California and Washington. Munger, the largest blueberry grower in North America, is the driving force behind the growers’ cooperative that markets under the Naturipe label. Companies using the H-2A program must apply to the U.S. Department of Labor, listing the work and living conditions and the wages workers will receive. The company must provide transportation, housing, and food. Workers are given contracts for less than one year, and must leave the country when their work is done. They can only work for the company that contracts them, and if they lose that job they must leave immediately. Silva collapsed, was taken to a local clinic, and then to the hospital where he died. CSI Visa Processing, the firm that recruited the workers in Mexico for Munger, later posted a statement on its website, saying “the compañero who is hospitalized, the cause was meningitis, an illness he suffered from before, and is not related to his work.” Nidia Perez was the liaison between Munger Farms and CSI. While Silva was in the hospital, sixty of his coworkers decided to protest. On August 4, they stayed in the labor camp instead of leaving for work. In addition to the production quota, they were angry about the food. The complaint says they were being charged $12.07 a day for meals, but the food sometimes ran out. When workers were fed, a supervisor marked their hands with “X” so they couldn’t go back for more. They were forbidden to eat in the fields. As the protestors sat in the camp, one worker called the Department of Labor, which sent out an inspector. The next day, when they tried to go back to work, company supervisors called out strikers by name and fired them for “insubordination.” Perez told them they had an hour to get out of the labor camp before the police and immigration authorities would be called. Supervisors stood in front of the barracks, periodically calling out how much time was left. Workers set up an impromptu encampment nearby with the help of Washington State’s new farm worker union, Familias Unidas por la Justicia. After a few days, all eventually had to return to Mexico. The death and firings at Sarbanand Farms highlight the explosive growth of this contract labor program. In 2006, U.S. employers were certified to recruit 59,112 workers under H-2A visas. Washington State certified only 814 H-2A positions that year. But by 2015, the numbers had mushroomed. Nationally, employers were certified to bring in 139,832 workers, including 12,081 in Washington State alone. Last year, Washington accounted for 18,535 workers out of 200,049 nationally. Driving this growth are some very big operators. CSI (Consular Solutions Inc.), the recruiter for Munger Farms, is probably the largest single recruiter of H-2A workers from Mexico. The company, originally called Manpower of the Americas, was created to bring workers from Mexico for what is today the largest H-2A employer-the North Carolina Growers Association. The group was founded in 1989 by Stan Eury, who formerly worked for North Carolina’s unemployment office, which plays a role in H-2A certification. Eury also created the North Carolina Growers Association PAC, a political action committee that donates almost exclusively to Republicans. Under pressure from Eury, courts have concluded that anti-discrimination laws don’t apply to H-2A workers. Employers are allowed to recruit men almost entirely. In 2001, the Fourth Circuit Court of Appeals ruled that the Age Discrimination in Employment Act does not cover workers recruited in other countries, leaving employers free to give preference to young workers able to meet high production quotas. In 2009, he challenged Obama Administration efforts to strengthen H-2A worker protections. North Carolina Legal Aid battled Eury for years over complaints of wage theft, discrimination, and bad living and working conditions, until he signed a collective bargaining agreement with the Farm Labor Organizing Committee in 2004. Despite his political clout, in 2015 Eury was forced to plead guilty to two counts of defrauding the U.S. government, fined $615,000 and was sentenced to thirteen months in prison. Nevertheless, the North Carolina Growers Association has been allowed to continue; last year, the Department of Labor approved its applications for 11,947 workers. Many H-2A workers feel conflicted about their situation. 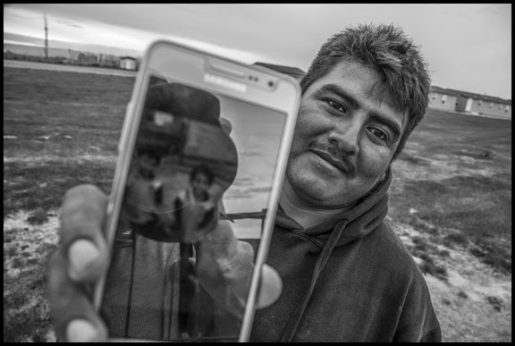 “We have papers, so we don’t feel in danger,” said Jose Luis Sosa Sanchez in a recent interview, at in a camp belonging to Stemilt Growers near Royal City, Washington. But he and other workers can’t buy property and establish a sense of connection to the community. In 2013, representatives of the Washington Farm Labor Association, originally part of the Washington State Farm Bureau now called WAFLA, showed up at a large Washington State winery, Mercer Canyons. 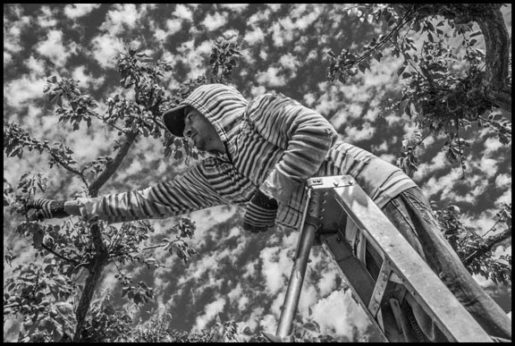 Garrett Benton, manager of the grape department and viticulturist, was then given a plan by the company owners for hiring workers for the following season. The rules governing the H-2A program require employers to first advertise the jobs among local residents. Local workers must be offered jobs at the same pay the company plans to offer H-2A workers, and the H-2A workers must be paid at a rate that supposedly will not undermine the wages of local workers. That wage rate is set by the unemployment agency in each state, and is usually slightly above minimum wage. But there is virtually no policing of the requirement that growers demonstrate a lack of local workers, or any efforts to hire them beyond a notice at the unemployment office. Benton said many of Mercer Canyons’ longtime local workers were told there was no work available, or were referred to jobs paying $9.88/hour while H-2A workers were being hired at $12/hour. The company, he said, even reduced the hours of those local workers it did hire in order to get them to quit. 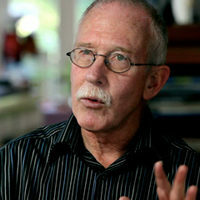 “Working conditions got so bad for the local workers that they eventually went on strike on May 1, 2013,” Benton stated. 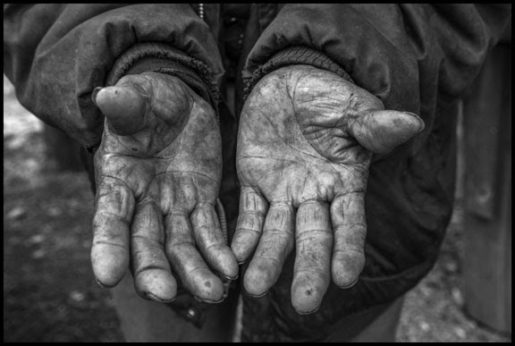 “They felt strongly that they were being given harder, less desirable work for less pay…. Mercer Canyons was doing everything it could to discourage local farm workers from gaining employment.” The class-action lawsuit involving more than 600 farmworkers was settled a year ago, and Mercer Canyons agreed to pay workers $545,000 plus attorneys’ fees, for a total of $1.2 million. In central Washington, the barracks springing up for H-2A workers all look the same-dusty tan prefab buildings built around a common grass area. Billboards next to rural roads advertise the services of companies including “H-2A Construction Inc.” This is a product of WAFLA’s aggressive growth strategy. “Our goal is to have 50,000 H-2A workers on the West Coast three years from now,” WAFLA’s director Dan Fazio told Michigan apple growers in 2015. In 2016, the group took in $7.7 million in fees for its panoply of H-2A services. It handles program application and compliance, provides transportation, recruits workers and gets their visas processed, and conducts on-site meetings with them. The premise behind the H-2A program is that it allows recruitment of workers by an individual grower who demonstrates it can’t find people to hire locally. Workers are then bound to the grower, and don’t function as a general labor pool. But a labor pool is exactly what WAFLA advertises. WAFLA’s “shared contract model” lets multiple growers share the same group of workers during the same harvest season. Workers might work for one grower one day, and another the next, at widely separated fields. The “sequential model” lets growers bring in workers for one harvest, and then pass them on to another grower for another harvest. 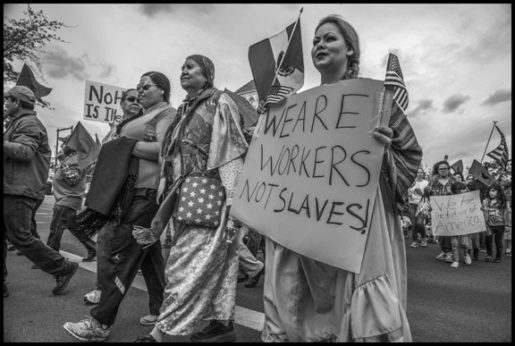 In its annual report for 2014, WAFLA boasted about helping block a proposed Department of Labor rule to make employers who use the H-2A program provide housing for family members of domestic workers. “Can you imagine a worker with a family of six demanding housing for his family a month after the start of the season when nearly all beds are full?” it asked. WAFLA has a close relationship with the Washington State Employment Security Department. Craig Carroll, the agency’s agricultural program director overseeing H-2A certification, spoke at the group’s “H-2A Workforce Summit” in January 2017, sharing the stage with numerous WAFLA staff members and Roxana Macias, CSI’s director of compliance. Macias herself worked for the department for two years, and then for WAFLA for three years, before moving to CSI. While the Employment Security Department is charged with enforcing the rules regarding H-2A contracts, its website states: “The agriculture employment and wage report will no longer be provided beginning with the May 2014 report due to a decline in funding.” The department did request an investigation by the state attorney general into charges by Columbia Legal Services that WAFLA had tried to fix wage rates at a low level. That investigation is still pending. Washington State also helps WAFLA by allowing it to use state subsidies for low-income farm worker housing to build barracks. This includes the ninety-six-bed Ringold Seasonal Farmworker Housing in Mesa, Washington. Subsidies were used to build another grower association’s $6 million, 200-bed complex called Brender Creek in Cashmere, Washington. 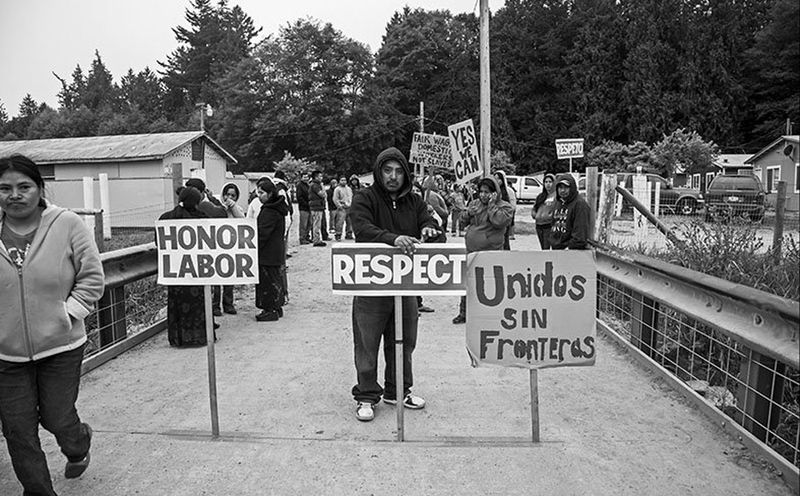 In 2013, when Sakuma Brothers Farms’ longtime resident workers went on strike for at least $14 an hour, they were told that the company would not exceed the H-2A wage rate of $12.39. In effect, the guest worker rate was used as a ceiling to keep wages from going up. Familias Unidas por la Justicia was organized during that strike. Its president, Ramon Torres, met the H-2A workers Sakuma had hired, “they said that they’d been told that if they talked with us they’d be sent back to Mexico,” he remembered. After the 2013 harvest, strikers received form letters telling them they’d been fired. Sakuma Brothers Farms then applied for 438 H-2A workers, enough to replace its entire workforce, saying it couldn’t find local labor. Familias Unidas collected letters from the strikers saying they were available to work, and turned them in to the Department of Labor. Sakuma Brothers Farms withdrew the H-2A application, and had to rehire the strikers. 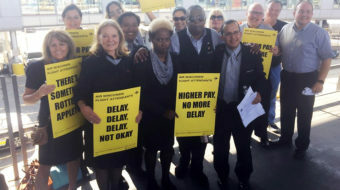 Because the workers saved their jobs, the union survived and finally signed its first contract last year. While the website conveys a certain desperate tone, most growers seem optimistic about the H2-A program’s future, due in part to the election of Donald Trump as President. While Trump has railed against some guest worker programs, especially the H-1B program used extensively by the high-tech industry, he has been conspicuously silent about H-2A. In fact, Trump’s family employs H-2A workers on its Virginia vineyard. And the H-2A program is popular among some of the most powerful Republicans in Congress, including Representative Kevin McCarthy, GOP House Majority Leader. Last fall, U.S. Representative Bob Goodlatte, Republican of Virginia, introduced a bill to expand the H-2A program. The bill, HR 4092, would create an H-2C visa category to replace H-2A, certifying the recruitment of 450,000 workers annually, a cap that would grow by 10 percent a year. Growers could employ workers year-round and re-enroll them for the following year while they are still in the country. Eventually up to 900,000 guest workers could be employed in the United States at any one time. Wages would be based at 115 percent of the federal or state minimum wage, or $8.34 an hour in states with the federal minimum wage of $7.25. As the Trump Administration beefs up raids and enforcements, growers want to ensure a continued supply of cheap labor.